I am a big green tea drinker and have always liked to give a try to many organic and inorganic varieties. When I was looking for a change, I came across Organic India's Tulsi brand. I decided to give this a try. Why should I choose this brand this time? We know that Tulsi makes an energizing and refreshing drink that possesses a vast array of wonderful health benefits. Tulsi, being an Ayurvedic medicinal herb, is used to treat headaches, digestive disorders, inflammation; poisoning etc. 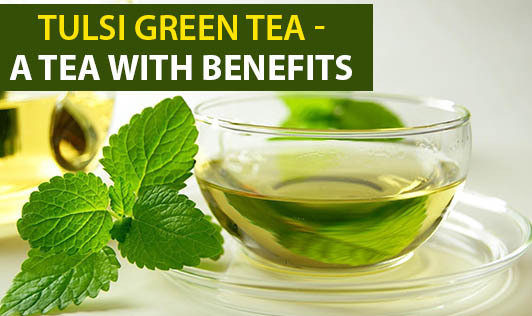 So, wouldn't you like to derive the health benefits of a unique blend of Tulsi and green tea? 1. Tulsi has the unique distinction of being the most effective anti-stressor and is known for its special flavor and fragrance. 2. Studies suggest that Tulsi tea may help to boost metabolism and improve digestion. 4. Enhances the body's natural immune system that helps to fight illness, cough and cold. The name "organic" will definitely make you buy one and the price of Organic India's Tulsi green tea costs approx Rs.150/- for 100gms as compared to other teas, which are priced exorbitantly. The tea package carton is made from 100% recycled paperboard with a minimum of 30% post consumer content. So, if you are fond of green teas, I would suggest you to try its different flavors which are added to green tea. Some of its flavors are - Original Tulsi, Tulsi Green tea, Tulsi Ginger, Tulsi Pomegranate and Tulsi Lemon. This will make a healthy alternative to caffeinated drinks and it gives you only 20kcal a cup. 1. In boiled water, add tea leaves or dip the tea bag into it. Let it steep for 2-3 minutes. 2. Transfer it to the cup to enjoy this hot refreshing drink. Tulsi tea smells fresh and is a great choice to a healthy start!